Some fabulous events & experiences are coming your way. 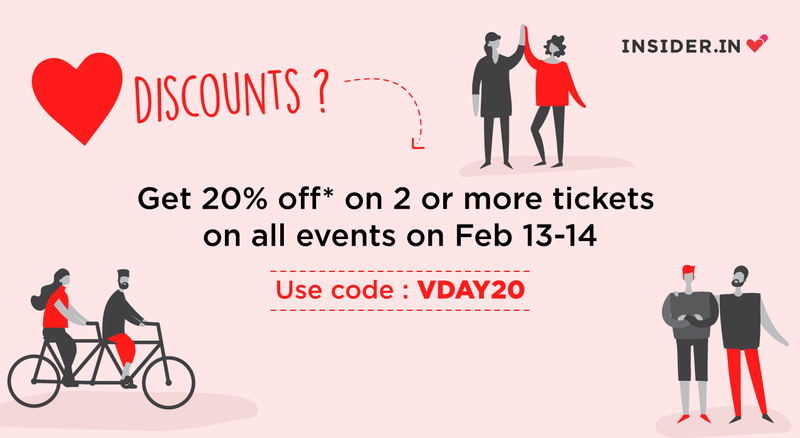 Get 20% off on them when you buy 2 or more tickets on the Insider.in app! Is that love in the air? We're not sure, but there are definitely some cool events in the air (or, at a venue near you). Insider.in always lists some awesome events for Valentine's Day (and V-Day eve): parties, dining experiences, themed comedy shows (come on, you know you want to be in that front row), movie screenings, camping events, workshops, gigs and more: For the romantic couples but also for everyone that just wants to have a good time! More events will come soon - keep watching this space! Nature is a great way to celebrate the day of love. Take your better half or your friends to these gorgeous gardens on Valentine's Day! This is a park on the Nagawara Lake which has boating, a wave pool and several other activities to ensure a fun-filled time. Cost: ₹30 for entrance. Separate fees for boating rides and wave pool use. Are you and your partner nature lovers? Here's an amazing way to spend the day together. Enjoy some flora and fauna on Valentine's Day at this gorgeous lake. Take a pair of binoculars along and spot billed pelicans, spot billed ducks, sandpipers, purple moorhens and purple and grey herons. And of course, take in the expanse of that magnificent lake itself. This Valentine's Day, sign up for a surreal experience. Get a stunning view of the sunrise by taking a hot-air balloon ride with your better half. Start the most romantic day of the year by getting a spectacular view of the city from the best spot. There's nothing more romantic than sharing a glass of wine with your partner after a long day. Why not spend an entire day tasting different wines and eating delicious food? You can visit Soma Vineyard, Grover Vineyard or Heritage Winery to learn about the process of making wine and indulging in a few samples. Take a walk along the winery field or sip on a few samples this Valentine's Day! While there's a lot to do all over the city, you can always have the best day at home. Cook a delicious meal, binge on your favorite tv shows and movies and wear your comfiest clothes to spend a fun night at home.